This spinning greeting card display is a space saver. It sits on your counter and has three tier. 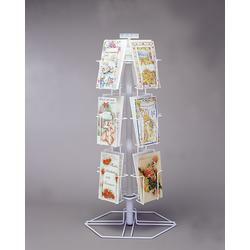 Each rack is multi sided, allowing customers to view your cards easily and fully. Rotating design makes it easy for customers to browse through items. The wire construction is versatile and highly durable.